It was the Spring of 2008. Birmingham, Alabama greeted us quite unkindly. We arrived just in time for a tornado watch, something New Yorkers never have to worry about. Hurricanes and three feet of snow, yes, but never tornados. Lightning and dark clouds could be seen in the distance accompanied by the sound of loud thunder. We were instructed to gather in the hotel’s lobby until it passed. People were concerned but not overly panicky, so I took my cues from them, as how to handle my emotions, while trying to stay calm. Thank goodness the threatening tornado passed over our area, but it did do damage to some nearby towns. You see, our granddaughter, Violet, had an intrauterine stroke before she was born, leaving her with limited use of her right arm and right leg. 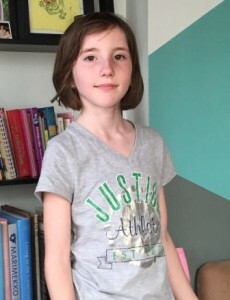 She was scheduled for one month’s therapy whereby her left arm, or good arm, would be constrained in a cast, forcing her to use “rightie.” Acquire Therapy, or constraint therapy, retrains the brain, forcing her to use the parts of the body that are not functioning properly. She was expected and encouraged to use her right hand exclusively. Eating, drinking, coloring, playing with toys are some of the things she was taught to do with her disabled arm. Not as much attention was given to her right leg as was given to the right side of her upper body. The main focus was on the fingers, hand and arm on her right side. In the quiet of the night, the sound of helicopters could be heard flying overhead while we lay in bed. We realized how frequently these small planes, carrying sick and dying children, transported them to The Children’s Hospital, across the street. The sirens of ambulances racing through traffic became a familiar sound. We offered many prayers, as chills ran down our spines, imagining what these children were going though. We considered ourselves very lucky that our situation was not life threatening. The first day at The University of Alabama, Violet got acquainted with the therapists, who evaluated her condition. Their job was to put a cast on her left arm, the good arm, the one she uses all he time, from fingers to elbow. It was not an easy task to fit a frightened, screaming baby with an unfamiliar molded object. She was uncontrollable, and rightfully so, as everyone tried to hold her down. Tom could not bear to see his beautiful little grandchild in such a state, so he had to leave the room. Quite an emotional day, to say the least. 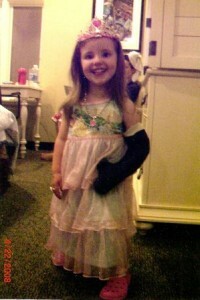 Not only did she have to get used to the very uncomfortable cast, but she no longer had use of her only working hand. The idea was to force her to use “rightie” as they named it. But she still managed to smile and laugh a lot through it all. 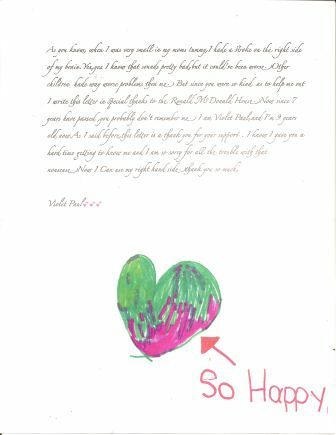 The next month was spent at The Ronald McDonald House where Violet received her therapy. Nanny and Poppy went back home after two weeks. Violet did most of her therapy in the library. Her therapist, Shelly Vest, was a young, attractive girl in her early twenties, well trained in her field of constraint therapy, firm with Violet when she did not want to cooperate, yet pleasant and cheerful. Six hours a day, five days a week, is a lot of work for a two year old toddler. A lot was accomplished during her time spent there. We were very impressed and pleased with The Ronald McDonald House. 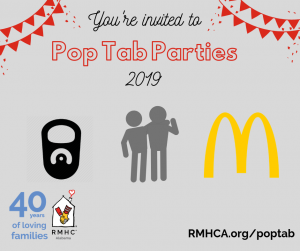 Less than a year old and beautifully decorated, the forty one room, Ronald McDonald House, (RMDH) stands proudly on 4th Avenue South and 17th Street, in the midst of medical centers and teaching hospitals. It has been “a home away from home” for hundreds of families. Lots of teddy bears, sitting on benches against the walls, greet the children in the entrance room. It is the first thing they see upon entering this inviting environment. April, Erin and Wendy, part of the highly efficient and friendly staff, warmly welcome guests, which creates a family atmosphere. The modern, fully equipped kitchen has two extremely large side-by-side refrigerators. We were encouraged to shop for groceries in the local supermarkets, and cook our own meals, if we chose to do so. Everyone labels their own food, but much sharing goes on. The departing families usually leave many canned foods and unopened packages for the rest of the guests, and for the new arrivals. Boxes of cereal are plentiful for all to share. Chips and cookies are always available. No one ever goes to bed hungry. We made an observation, though, that there seemed to be a lot of big Southern women in Birmingham, while the men looked quite undernourished. Ronald McDonald, himself, proudly sits on a bench in the backyard. The life size statue watches over the children from morning until night, in all kinds of weather. The state of the art playground is fully secure so no one can enter the area from outside. The fire alarms, I heard, were a gift from the local company. The indoor play area, adjacent to the dining room, has all kinds of toys, dollhouses and computers for the children to enjoy. During our stay, some organization sent a large box of collectible dolls, that found a home in the living room curio cabinet. In two corners of the living room, there are computers, one on each side of a large screened television. We were able to keep in touch with concerned family and friends though the internet connection provided, free of charge, by the cable network. The laundry room, equipped with new, modern washers and dryers, was also available to use anytime of the day and night. So many caring people and organizations volunteered, giving one of the most precious things in life – their time. I think of them as angels of mercy. Boxes of fresh muffins and pastries, delivered every few days by Starbucks, are placed on the counter, in a covered cake bin. They are then individually wrapped by the staff. Carefully prepared by their parents, the Girl Scouts cheerfully serve baked macaroni and brownies for dinner one night a week. Domino’s Pizza donates about fifteen boxes of assorted pizzas weekly. Once a week, Two Guys With a Van bring fully cooked chickens from Costco, and salad for dinner for anyone who is hungry. Daily newspapers are at the front desk, as well as magazines and books that are donated to the library. I got soaking wet one afternoon when I walked in the path of a water balloon, tossed by one of the football players from the University of Alabama. When they weren’t playing with the children, they could be found doing all kinds of chores, such as painting, yard work, refrigerator cleanup, even washing windows. The sorority sisters from the University of Montevallo frequently bake cookies with the children, and serve lunch for all. I was quite impressed by the unsurpassed generosity of so many local people and establishments. When we left home for Alabama, I thought I would be seeing so many sick children. I thought I would not be able to contain my emotions, but I soon realized that the really sick ones were all in hospitals. Instead, what we encountered were the families’ heartbreaking tales of their youngsters’ illnesses. During our stay, we met so many parents, grand parents, siblings and relatives that we will never forget. They will stay in our prayers forever. One Mississippi family who lived in a trailer had three well-behaved but rough little boys. Their southern drawl was so thick we could hardly understand them, nor could they understand our New York accent. Their new baby sister, born with a serious heart problem, had a couple of heart operations. They had been at the Ronald McDonald House for months. Finally they were going home since the baby was now out of danger. A woman, claiming to be a missionary, was with her daughter, whose newborn infant had terribly severe problems. If the child lived, she would have to be on life support for her whole life. They were forced to make that heartbreaking fatal decision. Another mom was living at the House for nine months because her baby was waiting for and finally received a kidney transplant. Danny, about ten years old, while playing with a cigarette lighter, that exploded, burned the upper half of body. His well meaning uncle tried to put the flames out by pouring water on him. That was the wrong thing to do. His chest was still burning when he arrived at the hospital. He was fitted with a cap to cover his head and a body shirt to wear twenty three hours a day. He had five skin grafts and was always in pain. Luckily, his cute little face was not affected though. Lauralie, a pretty little blond chatterbox, entertained us when she wasn’t visiting her sick sibling. At the end of the day, when Violet and Mommy finished their therapeutic work, we ventured out to the nearby towns of Five Points and Homewood. Niki’s Restaurant was a treat enjoyed by all four of us because of its home-style cooking. Ted’s and Milo’s also gave us a taste of southern cuisine. Lucy bought fabric at the local thrift shop and she found a deck of Tarot cards for me for only 75 cents. I did psychic reading for one of the staff members that evening. The spirit of giving extends to the children and their families in the form of passes to The Birmingham Zoo, The Botanical Gardens and the McWane Science Center. Vulcan Park and The Civil Rights Institute added to our cultural excursions. We especially liked the zoo, where Violet got to pet a giraffe. By climbing a few stairs to a small platform, we were eyelevel with the friendly giraffes. At night, when everyone was settled in, I would spend time downstairs in the library painting. I did a watercolor of the giraffe we met at the zoo, and gave it to RMDH to be raffled at their annual fundraising gala in August. The painting, and a bag of shampoos and hand creams that I packed with me from home for the residents of RMDH, was my small donation. Before Tom and I left for home, I took a photo of Violet looking at her shadow on the sidewalk. She was carefree, as only a child could be, leaving behind her frustrations of the day, absorbed in the present moment, happy, and beautiful.